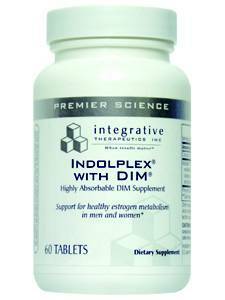 Indolplex Complex® is a dietary supplement for helping promote healthy estrogen metabolism in men and women. This unique formula contains the pure dietary indole, diindolymethane (DIM). Indoles are plant compounds found in all cruciferous vegetables (such as broccoli) and have health-promoting properties. The DIM in Indolplex is highly absorbable by the body through a proprietary, patented delivery system. Promotes natural support for estrogen balance and efficient fat metabolism. Specially-processed DIM (diindolylmethane) from Indoplex® for better absorption. One daily dose equals the benefits of least two pounds of raw broccoli. Indolplex® is helpful in the support of healthy prostate tissue along with weight loss. Prostate health in men can be effected by environmental and age-related hormonal changes. Optimizing the ratio of "good" estrogen metabolites (2-hydroxyestrogen) over "bad" estrogen metabolites (16-hydroxyestrogen) helps with Estrogen balance leading to better health.. DIM is the most active of the dietary indoles at promoting beneficial estrogen metabolism. Directions: Take 2 UltraCaps daily with food. If less support is needed, take 1 UltraCap daily with food.